Nowadays we can buy any jam we want in the supermarket. 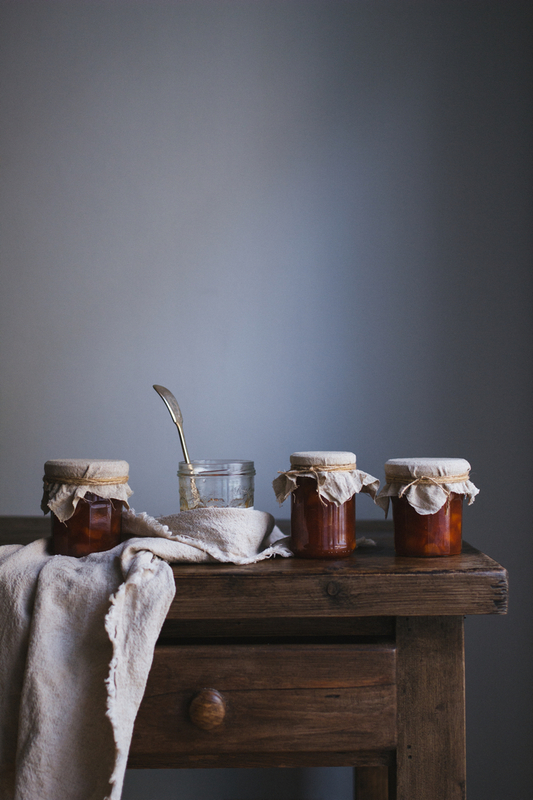 There are plenty of flavours: classic sweet and savoury, herbed jams, vegetable jams, etc… I can’t call myself a person who make a huge amount of jam every season, but there is always something magical in “jam-making” process. Something from childhood, which always reminds me my mum and those thrilling feelings that I’ve felt every time i opened a jam jar. 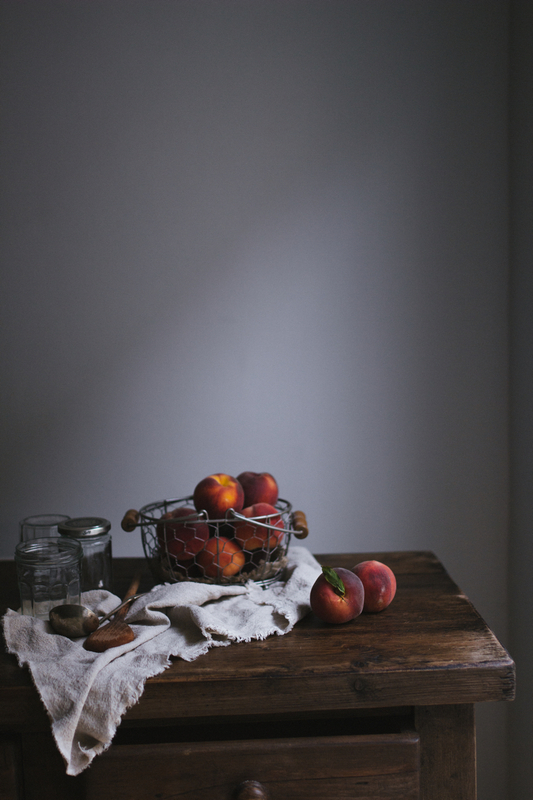 Today I want to share a recipe of one of my favourite jams – peach jam. Absolutely simple to make and absolutely delicious to eat! Few days ago I asked in my Instagram page what flavour is your favourite. I’ll also be happy to hear about that here because it is amazing how many people prefer so many different flavours! Anyway the most popular answer there was a berry jam. 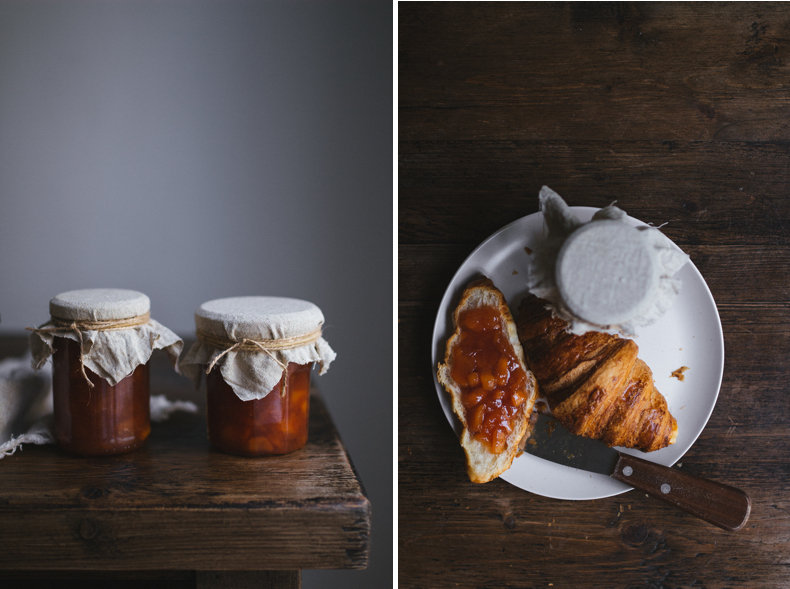 My favourites are raspberry and peach jams, those which are my mum’s speciality. 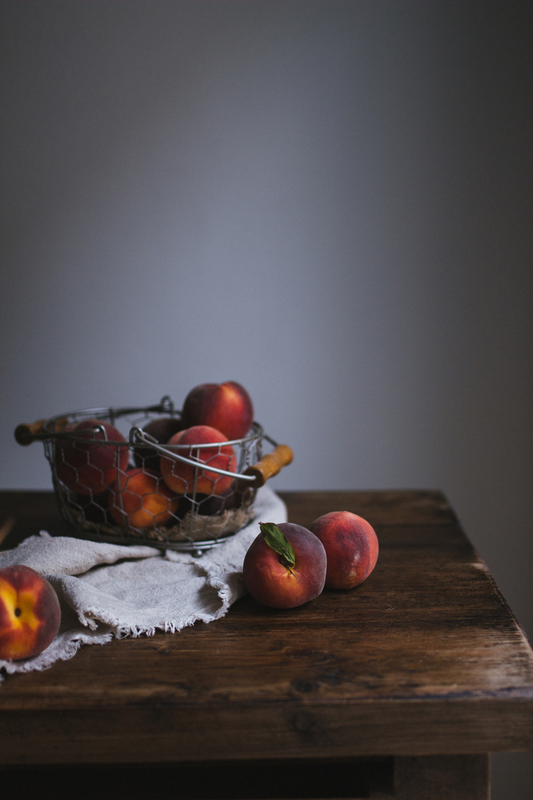 I’m going to make a raspberry jam as well soon, but today it will be a simple basic peach jam recipe. I prefer it with cut fruits, not blended. I enjoy catching peachy pieces in the jar! 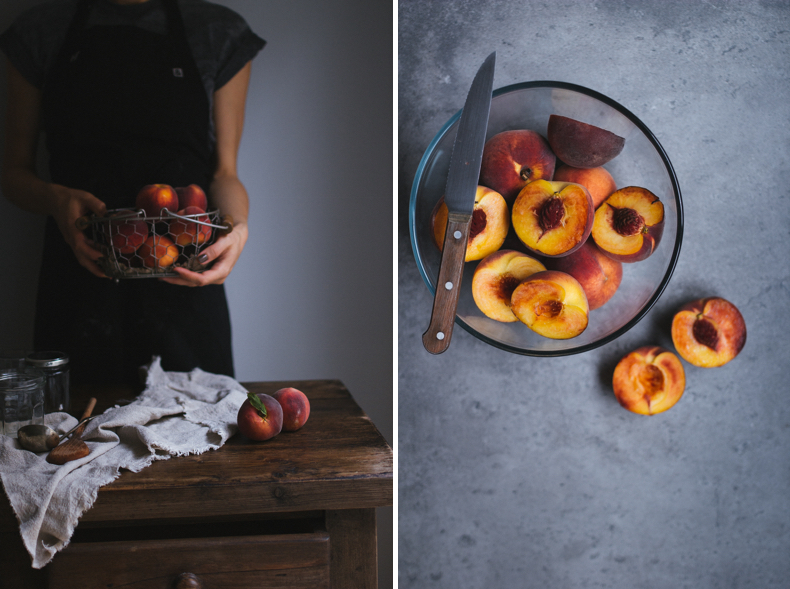 At first blanch the peaches. Wash them. Make a “X”-cut through the skin on the each peach. Place a medium pan on the heat. Prepare the bowl with cold water. 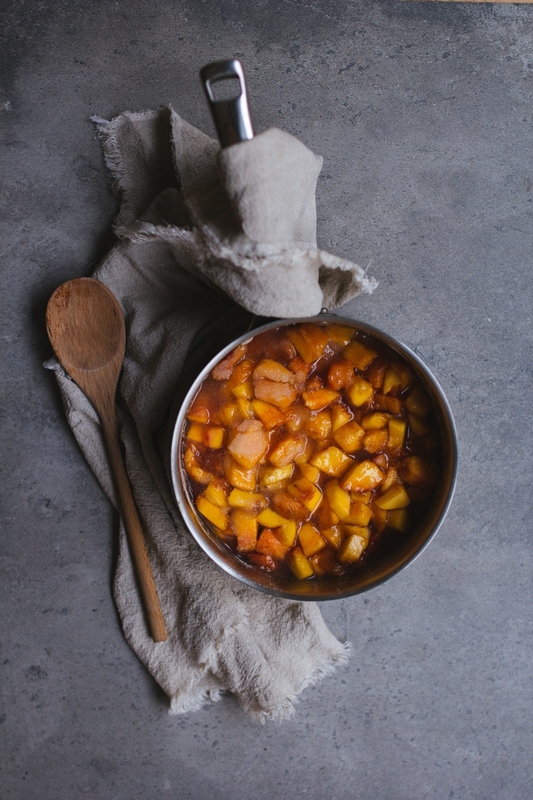 Put peaches into the boiling water for about 30-50 seconds. If they are under-ripe let them boil for a little more time. Then remove the peaches from hot water and place into the bowl with cold water. After that you can easily remove the skin. Cut skinless peaches into the pieces (i like to make 1-1.5 cm cubes). Place into the pan where you will cook the jam. Add sugar, pectin and lemon juice, mix. Bring to a boil stirring constantly and reduce the heat to the minimum. Cook your jam for about 30 minutes stirring time to time. After that test your jam if it is thick enough. Spoon a bit of your jam on the plate and place in the fridge for a minute until cool. 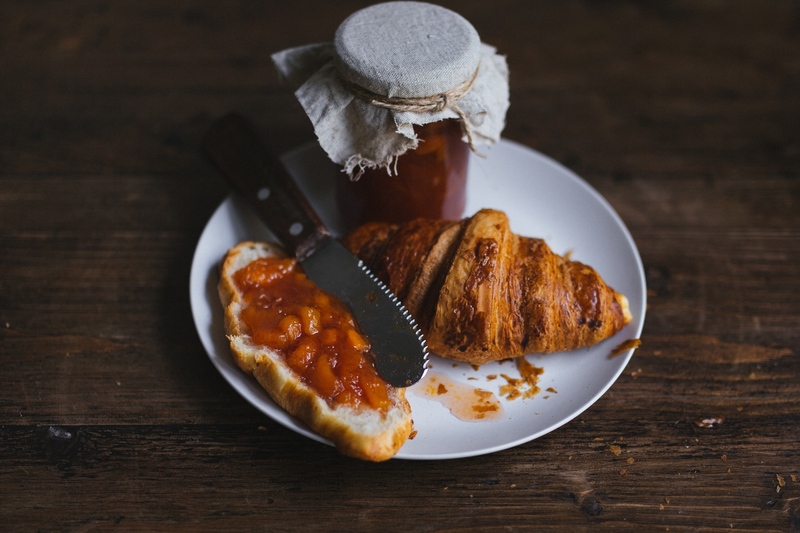 Look what you have got – jam should be a soft thick gel. If it runs down side of the plate let the jam cook another 10 minutes and repeat the test. Set aside and let cool for 15-20 minutes before spooning into sterilised jars. Meanwhile sterilise your jars. I do that by placing jars in the 160C degrees heated oven for 20 minutes. Pour jam into the sterilised jars and cover immediately. Let cool, label jars and store in a cool dark place or in the fridge. 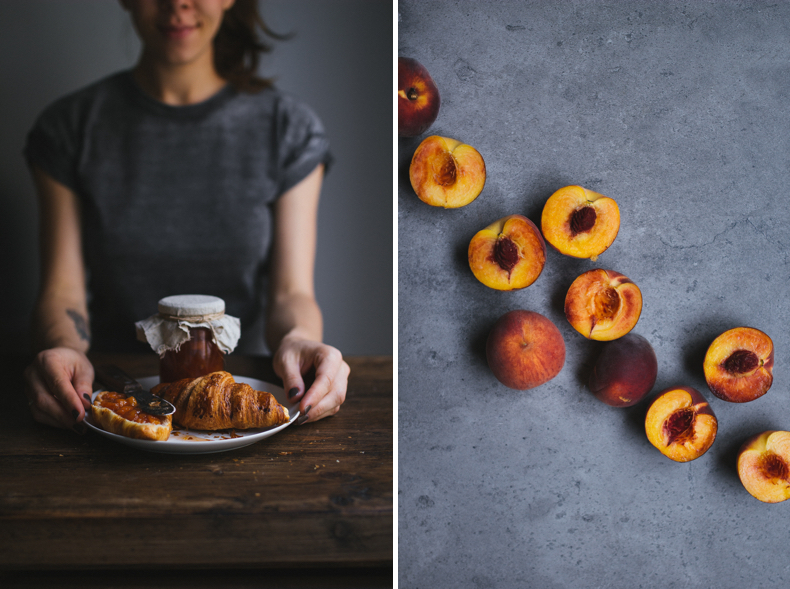 Try the peach jam with toasts, croissants or adding it into your morning oats. It also serves brilliant with cheeses! hi tanya, its always so lovely to find people who like to cook their own jam. 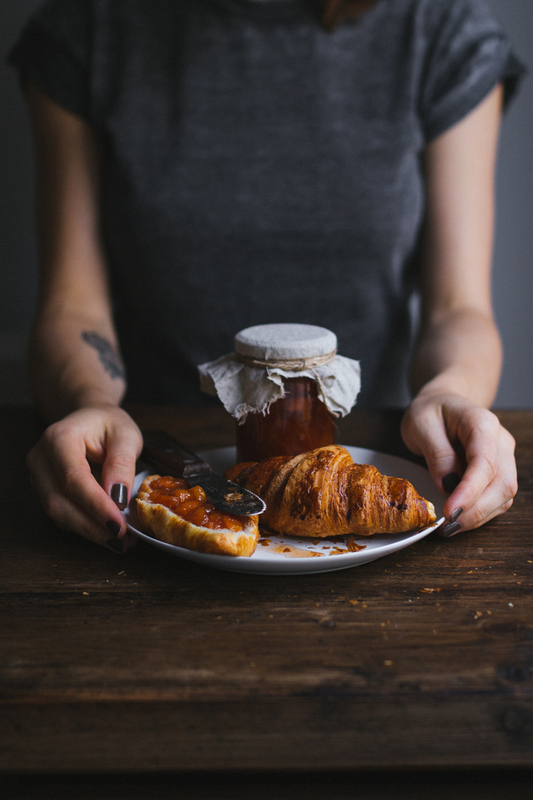 my current favourite is sour/sweet cherry jam with a hint of almond liqueur – although I like it normally pure and with only a type of fruit. but … last year it was apricot mango. 🙂 we should exchange some glasses .. and your pictures are gorgeous! the light is stunning ..
Hi, Susanne! Thank you very much!